MANHATTAN BEACH, Calif.--(BUSINESS WIRE)--With recognition that Puerto Rico remains in need of many essentials a year after Hurricane Maria devastated the territory, Skechers USA, Inc. (NYSE:SKX) has donated 15,000 pairs of new shoes to children on the island. The donation is part of the Company’s BOBS from Skechers philanthropic shoe program, through which the Company has donated 15 million pairs of new shoes to children affected by poverty, homelessness and natural disasters around the globe. Skechers coordinated with charity partner Delivering Good, local organization the Carlos Beltran Foundation and Skechers retail employees on the ground to deliver shoes to approximately 1,200 children through three donation events in August and September in the San Juan and Vega Baja regions to date, with another 1,900 pairs to reach children at seven donation events throughout the island by the end of September. Additional events are planned through the remainder of 2018. The territory-wide relief effort is the latest in a series of donation events that the footwear brand has launched for hurricane victims in Puerto Rico and the States. 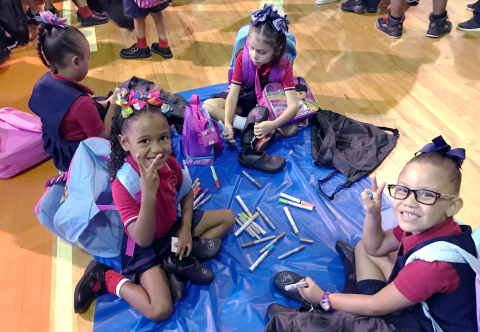 In February 2018, Skechers donated 5,000 pairs of socks and 2,400 backpacks in care packages benefitting Puerto Rico’s city and remote residents. The Company also partnered with Delivering Good to distribute BOBS from Skechers shoes, goods and relief to flood victims in Texas and Florida following Hurricanes Harvey and Irma in 2017. Since the program’s inception in 2011, the BOBS from Skechers program has donated new shoes to more than 15 million kids in the United States and more than 30 countries worldwide through the Head Start programs, education foundations, homeless shelters, disaster relief, and 501 (c)(3) organizations. Beyond the United States, the list of countries receiving donations in 2018 has also included Nicaragua, Haiti, Netherlands, Guatemala, Honduras, Jamaica, Lebanon and Jordan. SKECHERS USA, Inc., based in Manhattan Beach, California, designs, develops and markets a diverse range of lifestyle footwear for men, women and children, as well as performance footwear for men and women. SKECHERS footwear is available in the United States and over 170 countries and territories worldwide via department and specialty stores, 2,715 SKECHERS Company-owned and third-party-owned retail stores, and the Company’s e-commerce websites. The Company manages its international business through a network of global distributors, joint venture partners in Asia and the Middle East, and wholly-owned subsidiaries in Canada, Japan, throughout Europe and Latin America. For more information, please visit www.skechers.com and follow us on Facebook (facebook.com/SKECHERS), Instagram (Instagram.com/SKECHERS) and Twitter (twitter.com/SKECHERSUSA).